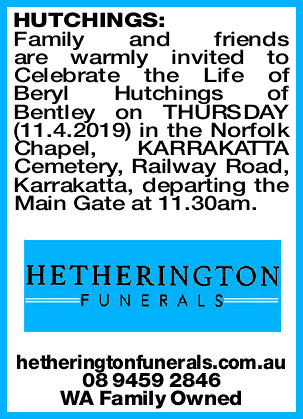 Family and friends are warmly invited to Celebrate the Life of Beryl Hutchings of Bentley on T HURSDAY (11.4.2019) in the Norfolk Chapel, KARRAKATTA Cemetery, Railway Road, Karrakatta, departing the Main Gate at 11.30am. 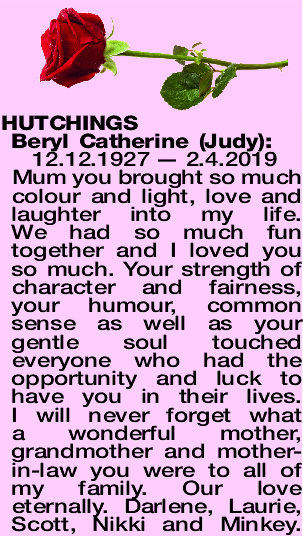 12.12.1927 — 2.4.2019 Mum you brought so much colour and light, love and laughter into my life. We had so much fun together and I loved you so much. Your strength of character and fairness, your humour, common sense as well as your gentle soul touched everyone who had the opportunity and luck to have you in their lives. 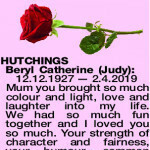 I will never forget what a wonderful mother, grandmother and mother- in-law you were to all of my family. Our love eternally. Darlene, Laurie, Scott, Nikki and Minkey. 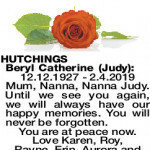 12.12.1927 - 2.4.2019 Mum, Nanna, Nanna Judy. Until we see you again, we will always have our happy memories. You will never be forgotten. You are at peace now. 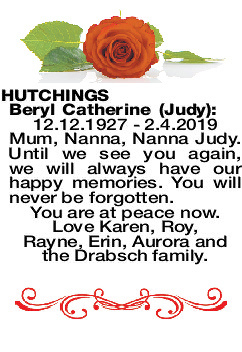 Love Karen, Roy, Rayne, Erin, Aurora and the Drabsch family. Fond memories of a lovely lady. 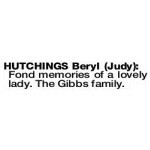 The Gibbs family. Farewell to a loved, long time friend. Fond memories of happy times together. Harry and Alison Murray and family. My beautiful wonderful life long friend with many happy memories now free from pain. I will miss you every day. Sympathy to Dahlene and Karen and all the family.